Once the Nazis rounded up the Jews and other groups that they opposed for reasons difficult if not impossible to believe, and transported them into concentration camps, there was little hope for their survival. In Poland, which had the largest per capita number, only one Jew out a hundred survived, usually liberated by Russians or Americans. On the other hand, many Jews who once lived in areas occupied by Germany during World War II were able to survive by leaving for the UK, the U.S., or Israel provided that they realized Hitler was not about to go away in a few weeks or months and were courageous enough to give up their property and money by escaping. There is another segment, some 7000 according to historians, who hid in plain sight, given refuse by Christians at the risk of their own lives, refusing to leave and taking their chances. Yet only 1700 survived thanks to the civilian creeps who informed on the others with the Gestapo and especially from the loathsome Stella Goldschlag who used her beauty to ferret out Jews and who, after serving time in a Soviet prison, converted to Christianity and became an anti-Semite. 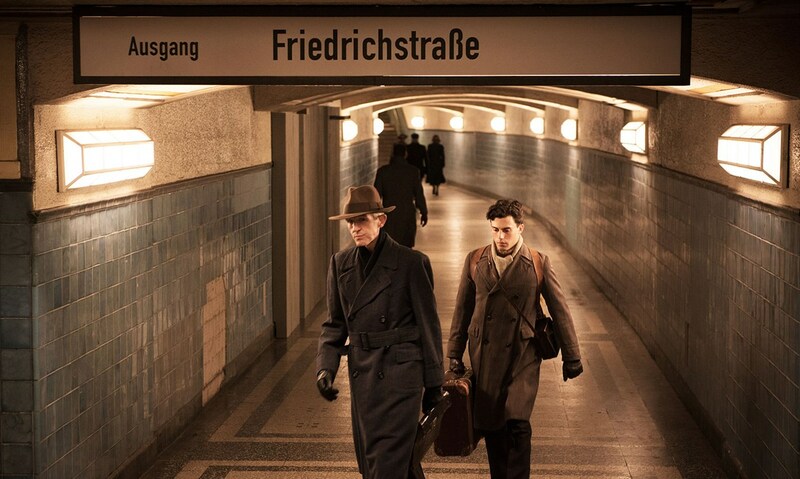 “The Invisibles” is a docudrama about four Jews who remained in Berlin intent on trying their luck. Claus Räfle in his freshman work for the big screen, informs his audience about both the rashness of their decision and the prudence which allowed them to remain calm and not to allow their youthful energy to lead them into captivity. Räfle, who co-wrote the drama with Alejandra López, employs grainy archival film from the war, frequently cutting from the colorful modern shots, while also pausing to focus on the individuals as they live now. This is a technique that has good and bad points: the latter because it interrupts the flow, and praiseworthy by showing the audience that these folks are still alive (except one who died after the filming) with sharp memories of the most fearful event in their lives. The film could have avoided confusion by concentrating on two people instead of four, one, Cioma Schönhaus (Max Mauff) who wound up with a counterfeiting ring, thereby saving thousands of his fellow Jews, and another, Hanni Lévy (Alice Dwyer), who died her hair blonde and lived by daily visits to the local cinema. Lévy found refuge with the woman who sold tickets and who, maybe, could have figured that a young person seeing the same movie over and over might be hiding from the authorities. Less developed cases involve Ruth Arndt (Ruby O. Fee) and her sister who turned up as maids for a military officer who knew full well that he was harboring Jews. In framing the work, director Räfle gives attention to both the talking heads and the dramatizations, the latter being the more absorbing thereby avoiding the plight of documentaries that spend all their time on interviews without dramatic contextualization. The team of survivors dish out credible performances, the most alluring to me being that of Alice Dwyer’s Hanni, who might stand in for perhaps scores, maybe hundreds of young Jewish women who could pass because for one thing, Germans could not imagine that Jewish hair could be “Aryan-color” and for another, Goebbels announced in 1943 that Berlin was free of Jews. If you go to Yad Vashem in Jerusalem, be sure to look up the names of Righteous Among the Nations, Christians who risked their lives hiding Jews like the ones in this film, many found out and executed. The film was a feature at last year’s Jewish Film Festival and should be seen by folks of all ethnicities, religions and races. If you go to Berlin, and you should, you can’t miss the Memorial to the Murdered Jews of Europe, 2711 stelae or slabs taking up the entire city block. Germany today, unlike Turkey, does not hide its wartime crimes, openly advertising tours to such structures as the Jewish Museum. The Jewish community of Berlin, which in 1933 numbered 160,000, became what Goebbels called free of Jews in 1943, and is now home to 118,000 Jews who no longer need to hide.